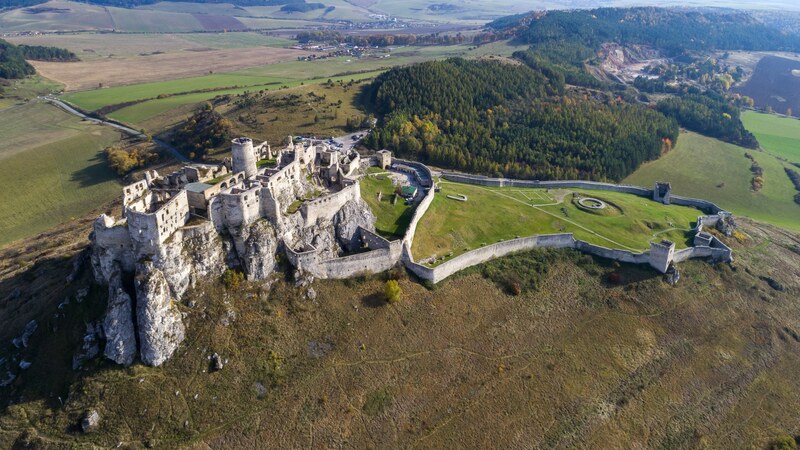 Just east of the imposing High Tatras—Slovakia’s proudest mountain range, on top of a lofty hill, lies the mighty Spis Castle. Though a ruin today, the castle’s strength is still evident on its thick walls and rugged towers. Vast in size it occupies most of the hill casting its shadow on the nearby village of Spisske Podhradie to the west. 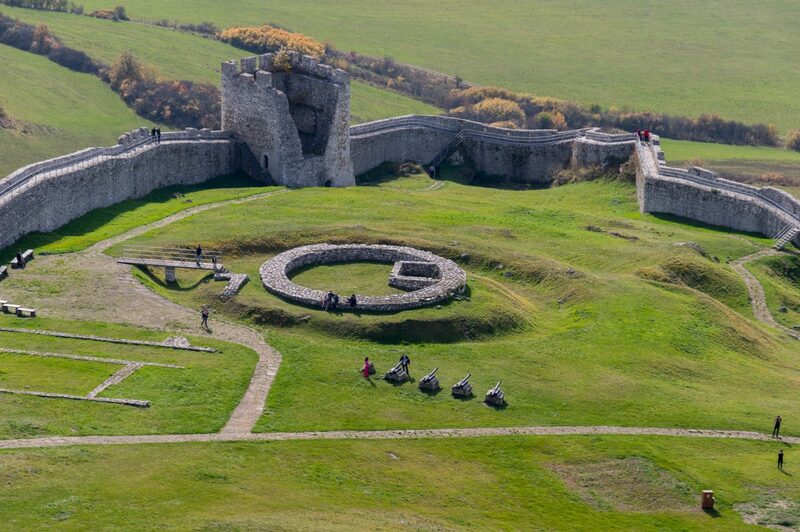 Built in the 12th century by the Hungarian Empire, its mission was to defend the region from the Tartars till 1464 when it changed hands and went to a series of aristocrats, losing its military purpose and becoming a seat for these feudal families. Csáky family was the last to own Spis castle till 1945. After that it went to the state which declared it a national monument in 1961. A fire in 1780 and the usage of the castle’s stones for the building of other mansions left it a ruin and it was not before 1969 that the reconstruction process begun and is still being carried on today. The castle has two entrances. The main one from the west and a secondary on the south wall of the lower yard. We decided to go for the former, so after dropping the car in the parking we took the snake like road that leads to the gate further up the hill. A series of stone columns is the only thing left from the palisade wall (wall made from wooden stakes) which was used as the first line of defense in front of the castle’s entrance. Next is the barbican (fortified structure in front of the gate) with a double wall that encircled the gate tower and controlled the passage creating an enclosed space at the same time which is also known as “death trap”. A ditch between the barbican and the palisade made sure that anyone who wanted to go in, would have to do it through a small wooden bridge that led to the barbican’s entrance. The gate tower led us to the middle of the castle—a bailey (walled courtyard) with small houses along the south wall, used in the past as dwellings and arsenal for the guard. Once, there also was a bigger building right in the middle but only the foundations have survived. The yard is surrounded by walls that have battlements with embrasures and loopholes on top. Leaving the central courtyard, we took the paved road that goes up the slope and went through another gate to the main castle’s yard which is smaller and narrower. There, we found the ruins of the castle’s mill and an administrative building before going up one more level to the top of the hill where the main castle is. This is where all started. Every level below the main castle was built in later stages. The structure that dominates the castle is of course the circular keep in the middle. Around 20 meters high I estimate, you can climb to the top of it by a narrow spiral staircase. From there you can watch the surrounding area to a great distance as well as overlook the whole castle all the way to the lower yard. The view is magnificent and worth the stairs. On the ground, an arcaded wall connects the keep to the atmospheric chapel of St. Elizabeth. Just behind it is the eloquent roman palace which is considered the jewel of the castle and one of the most beautiful in Slovakia. 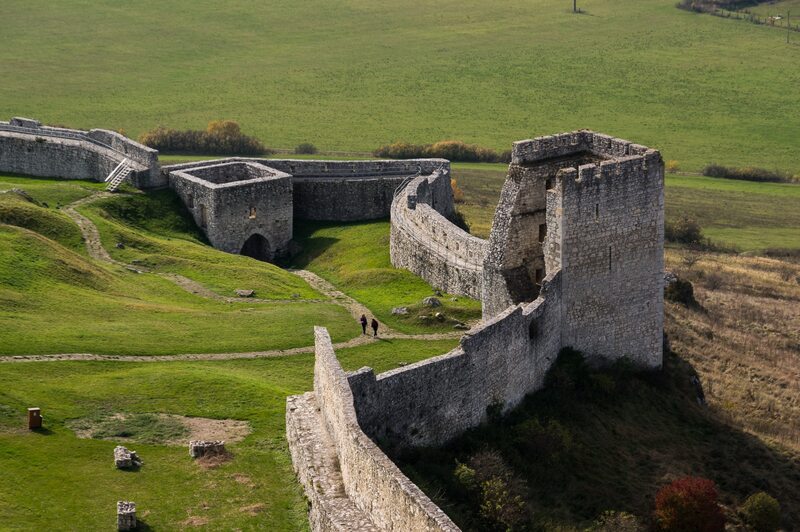 Its outer side is not protected by a wall since it’s located on the highest and steepest side of the hill which would make an approach by any attacker rather impossible. Up next we went into the main structure of the castle which is built along the west side of the top level. The lower part of this building has been reconstructed into a museum which hosts an impressive arsenal where visitors can see medieval armors and weapons as well as early firearms like canons and hand canons. The torturing devices collection is also very interesting and shows why Middle Ages was also called the Dark Ages. An Iron chair (seat with spikes) and the notorious rack (stretching device) show what people had to go through before eventually finding a slow and painful death that could take days or weeks to come. A fully equipped kitchen and a bedroom of the era concludes the museum’s exhibits. Observing the castle from the top level helps someone understand how the whole thing was built and evolved through the centuries. The first keep that was built on the top level (between 11th and 12th century) did not last. Its foundations are still there just north of the current tower which was built later (13th century) as was the castle’s upper and middle bailey (2nd level and 3rd level). The lower courtyard which is the biggest part of the castle was built later as were the chapel and roman palace on the top. We headed back to the middle yard again in order to get in the main courtyard which can be accessed through a small gate to the east. Perhaps the most “cinematic” part of the castle, it’s vast long and narrow. The sloped ground is entirely covered with grass. Before the curtain wall that forms it was built, there was a barbican guarding the middle yard’s gate which became useless after the lower yard was constructed. Near the lower part of the yard is a big circular foundation surrounded by a ditch. It’s the remains of a tower that Jan Jiskra of Brady’s had built as commander’s quarters for his mercenary army which was camped on the slope. Later he built the lower courtyard hence eliminating the need for that tower which after being used as a gun storage was demolished. These walls are different from the ones in the upper castle because the walkway is built lower therefore it covered entirely the defenders from outside. Naturally there are no crenels on top but loop holes from where troops could open fire. Three big rectangular wall towers defended the far end of the yard, the middle of which has a gate leading west to the village of Spisske Podhradie which is at the foot of the hill. There is also a number of bastions (projecting parts of the wall) on the west and south sides. This huge open area was made for military purposes initially but after a certain point it was used mostly for commerce. There was a number of structures including stables, traces of which can be still seen on the upper part. Nowadays it is has been taken over by a colony of little ground squirrels (Spermophilus) who decided to dig their burrows under the grass and make it their home. We saw a few of these cute little fellas as we were strolling around. 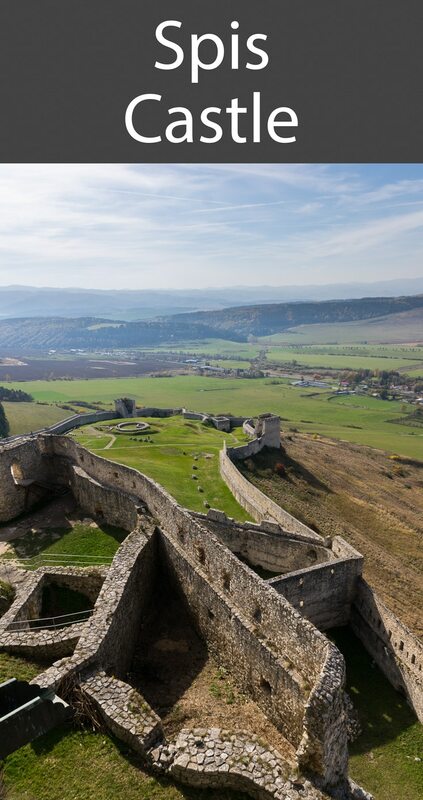 Spis castle is definitely one of the most impressive castles not only in Slovakia but Europe too. It’s only fair that UNESCO has included it in the World Heritage List. It may not have the romantic beauty of Bojnice castle but it surely has the might that a medieval fortified structure should have . Its location and architecture are magnificent plus that even though it has been through a lot it is in a fairly good condition and when its reconstruction is over I’m sure that it will be one of a kind. Overall it’s a great place to spend three or four hours. It’s halfway between the cities of Poprad and Presov. The bus takes 8 hours from Bratislava (4hrs by car), 40min from Poprad, 50min from Presov and 1:20 from Kosice. The bus stop is at Spisske Podhradie and from there you will need to walk for 30 minutes all the way up to the south entrance. Spisska Kapitula: A small wall enclosed church town on the edge of Spisske Podhradie dominated by the cathedral of St. Martin. 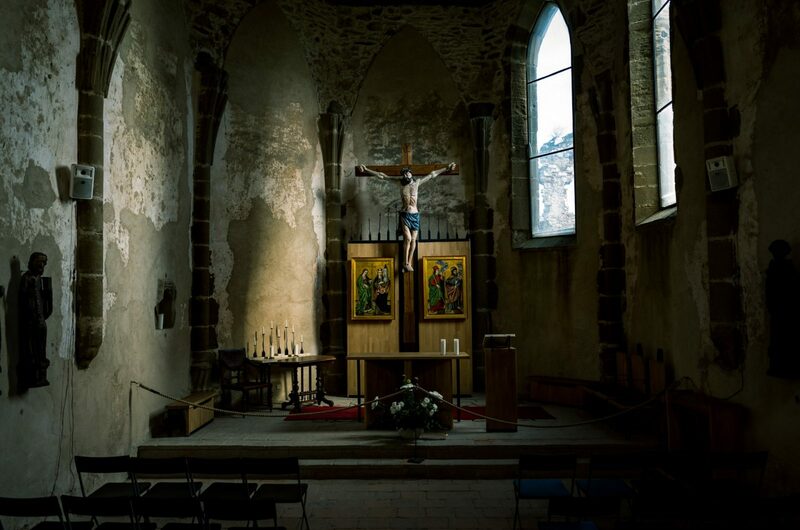 The Church of the Holy Spirit in Zehra: Not far from Spis Castle to the west is this beautiful medieval church in Romanesque-Gothic style. Both of these locations are part of UNESCO’s Heritage List. Thank you! Yes all the footage is mine. This is a lovely castle, and the surroundings are beautiful too. Did you use a drone for the overhead pictures? It is! Yes, those are shot with a drone. These photos are amazing! Did you use a drone to get the overhead shots? I love castles and all the history that surrounds them and this sounds like a fascinating castle to visit. Nice drone shots and really interesting location. What is the model that you use? I am considering getting a drone for myself. Thanks, it’s a Phantom 4 Pro. WOW what an amazing castle! Indeed this is a true masterpiece! I admire its unique architecture and design that lasts for many centuries. Lucky you for visiting this treasure. True, simply amazing. 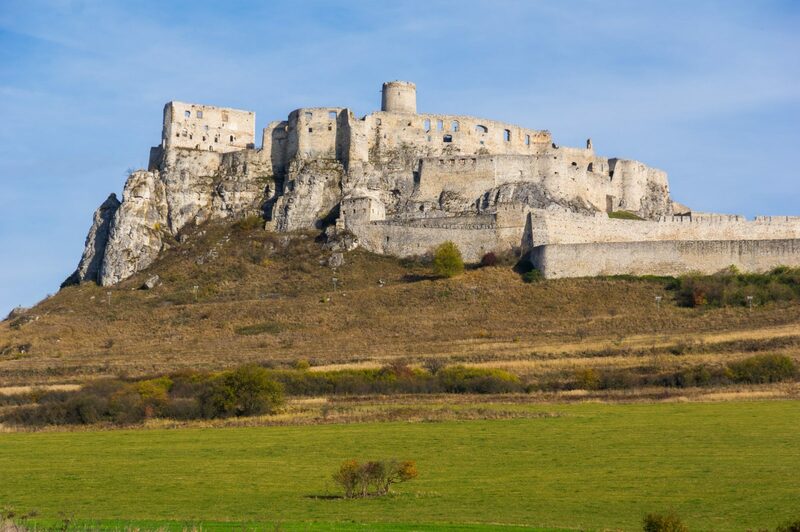 Slovakia is one of the countries that you must visit if you are interested in medieval architecture.